survival is an impossible dream in Afghanistan. Last December, as Afghans looked up to the deceptively beautiful sky for rain, bombs rained from endless streams of b-52 bombers -- each 'smart' bomb costing more than Afghanistan's gdp. On the ground, the situation was no different. In Tora Bora and other mountains -- where usa believed its enemy number one Osama bin Laden was hiding -- most of the country's life-saving traditional water canals known as karez were being flattened. So were Afghanistan's hopes for survival. "Why did they bomb our water canals," asks Azimullah, 25, a peasant whose village, Agam, overlooks Tora Bora. There is no water in karez. And this is the fourth drought year. Azimullah is now worried about the next wheat crop: "No rains during winter means no wealth in May." By all probability, Azimullah must have left for a refugee camp, ignorant of us president George W Bush's declaration of a Marshall Plan for his country. The country's interim prime minister, Hamid Karzai, is hurriedly preparing the country's constitution to make way for a global aid pledge of us $4.5 billion. But aid has never reached Azimullah's village. Refugee camps in Afghanistan's urban areas are teeming with people like Azimullah, carrying the reluctant burden of two decades of war. War has driven Afghanistan's one-third people out of their country. Starting from the proxy war of the superpowers in the 1960s through 1980s, to the brutal internal conflicts in the 1990s, Afghanistan remains a 'great game.' According to the International Committee for Red Cross (icrc), around 1.7 million people have been killed in the last two decades. Around one million people are believed to have moved to remote mountainous areas to escape the war, which has gripped almost the entire country. The shadow of war has eclipsed the whole country leaving hardly any place to escape. Desperate farmers run to their lands with the smell of rain, only to be blown into pieces by anti-personnel mines. Around 10 million landmines dot Afghanistan -- 45,000 landmines in every 25 sq km -- making it the world's most densely mined area, according to un secretary-general Kofi Annan. And this is a major deterrent for the revival of agriculture and animal husbandry, which accounts for its 95 per cent population's livelihood. "An estimated half a million households are without a male provider," says Anne Bauer, the head of Food and Agriculture Organisation (fao) for Afghanistan. Children are the worst affected. A 1997 survey of 300 children carried out by unicef found that 90 per cent believed that they would die during the conflict. The World Health Organisation says that some five million Afghans are suffering from psychological distress. For a country with two-thirds land covered with mountains, precious natural resources like water and agriculture formed the backbone of a fragile economy. "The marathon wars have changed all that. Afghanistan's environment is completely devastated," says N S Jodha, a natural resource management expert with International Centre for Integrated Mountain Development (icimod), a Kathmandu-based research organisation studying the Himalayas and Hindukush region. The country's 80 per cent rural population are the worst hit as they depend on agriculture. An estimated 36 per cent of all irrigation systems (according to Afghanistan's former president Burhanubbin Rabbani's speech at the un) were directly affected by war. These figures, however, do not take into account the indirect effects of neglect and abandonment. "War has swept across Afghanistan like wildfire, leaving broken lives and barren landscapes in its trail. It is a conflict without end, warfare has physically erased many of their country's natural resources," says an icrc's report on Afghanistan published in 1999. As for the remaining two-thirds of the population, Rabbani says, "I am not sure about them. Those who have left the country are lucky." Indeed. The two-third residents of Afghanistan, if not crippled by the war, are fighting another battle: the fourth consecutive drought. Famine is imminent. The World Bank says that seven million people are vulnerable to famine this year -- more than half the country's population. The deficit of wheat up to next June is around 1.7 million tonnes, according to a November 2001 fao report. Drought has halved the harvest as compared to 1998. "Ninety per cent of people in this region depend on agriculture and have been affected by drought," says Nigel Pont, a programme officer of Mercy Corps, an international aid agency working in Kandhar city. 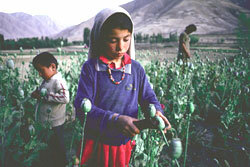 The bombing that began in October 2001 has made sowing difficult for peasants. Relief agencies estimate that 7.5 million people, displaced by war and drought, will need food assistance. But help is never going to come easy. Post September 11, aid agencies have disappeared due to military intervention. War has driven people into remote areas and ongoing military intervention has kept relief agencies away from them. Life has become a very difficult proposition. "In some remote areas such as Uruzgan province, drought refugees are barely surviving. People are living under bushes with no water. It is an absolute disaster," he says. In Kandahar, villages have been polarised over access to water: poor are those who buy water and rich are those who can dig deep wells to get water. There was a glimmer of hope this January and April. It rained a bit. But farmers didn't have the seeds to sow. And finding seeds suitable to Afghanistan's climate is an equally daunting job. The country has exhausted all its indigenous varieties. A desperate worldwide search has zeroed on a deep freezer in one of Turkey's agriculture research institutes, which has stored some of them. These need to be cloned. Even fao's emergency appeal of us $39 million for agricultural rehabilitation has a major component on seed procurement and distribution. " fao is focusing on seed production and distribution, better water management, animal production and animal health as priorities," Cyril Ferrand, fao deputy emergency coordinator for Afghanistan. These seeds could well be the starting point to restore the traditional economy of a once-rich country. life ravaged by war and drought has one hope: resilience of a people. "A good monsoon and a bit of peace will bring Afghan's life to normal," says J Gabriel Campbell of icimod. Take Kohistan district of Kapisa province for example. Just after usa bombarded and damaged water channels in January this year, residents came together to revive them. One week of community labour brought water to the channel. Now residents are waiting for their first harvest of wheat in seven years. In many ways, Afghanistan has a very productive ecology. Even with scarce resources, it has managed to ensure life for some 20 million people. Land and water are two crucial resources that have shaped the country's economy and ecology. About 85 per cent of the country's population is engaged in rural economy based on agriculture even though only 15 per cent of land is suitable for farming. Agriculture has been affected by drought and more than two decades of war. Poorly designed and controversial land reform programmes were undertaken in the 1960s and 1970s. But in the past two decades, re-allocated land has largely reverted to original owners or been seized by both Taliban and Mujahideen commanders. This has left many of the farmers as agriculture labourers. Disputes and conflicts over landownership or usage are widespread. While landholding patterns in Afghanistan vary, both between and within districts, sharecropping is common on irrigated lands. But there is panic now as the one-third population of the country in exile is set to come back. According to undp strategy paper on Afghanistan, it will lead to severe constrains on the already degraded resources and can lead to conflict. It is better understood by the estimate of the un's least developed report of 1996, which says that the dependence on agriculture is growing despite lower yields. The share of agriculture in labour force has gone up from 61 per cent in 1980 to 69 percent in 1996. It should be more now. On the other hand, land under cultivation is totally dependent on irrigation. About six percent of the land is actually cultivated, while at least two-thirds of this farmland requires irrigation. Half of the country gets less than 300 mm rainfall and the barren terrain retains hardly any water to be used later. Agriculture accounts for 99 per cent of water use. Except for the river valleys and a few places in the lowlands, where underground fresh water makes irrigation possible, agriculture is difficult. Since 1967, many figures have been given for irrigated, rainfed and total cultivated areas. Unfortunately, most of them are unreliable. Some pre-war publications suggest that 2.8 million ha were cultivated, of which 1.4 million ha had sufficient water to support double-cropping. Since 1996, the irrigated area has declined by around 60 per cent. According to fao, only 30 per cent is managed satisfactorily, 10 per cent has been destroyed by the direct impact of war and 40 per cent is damaged due to lack of maintenance. Due to the increasing use of groundwater in recent years, there is a risk of overexploitation and depletion in the absence of regulating and licensing authorities, which in some places might lead to the drying out of karez or qantas , springs and wells, depending on the same water sources. However, the traditional sources despite being neglected for years still have the potential to irrigate lands. According to an assessment made by fao in 1996, water resources in Afghanistan are sufficient to support the irrigation of 5.3 million ha. In 1987, about 26,600 sq km of farmland were irrigated through such systems. Rivers contribute 84.6 per cent of water need, springs contribute 7.9 per cent, karez contribute 7 per cent and Persian wheels half a per cent. There are about 6,470 karez and also thousands of other small dams (similar to India's village tanks), which are in use (see box: Tunnels of hope). Since the scarce natural resources are an integral part of Afghanistan's economy, they have been targets during wars. Successive invaders gained control over the country by destroying their natural resources. In the 13th century, when Genghis Khan invaded Afghanistan, he destroyed the irrigation systems, which led to a slump in agricultural production for generations. When the erstwhile ussr invaded the country in 1979, it destroyed irrigation facilities and agricultural fields as a strategy to break the economy. "Soviets wanted to wreck the patterns of rural life and drive out as many Afghans possible," says B Madjrouth, a professor at Kabul University. More than one-fifth of Afghanistan's population fled during the Soviet occupation, according to Madjrouth. The collapse of the Cold War saw the us playing an active role in the region. And this interest has a lot to do with the business of oil. There is a strong belief that usa is looking for a secured pipeline to transport oil from central Asia. "Afghanistan's significance from an energy standpoint stems from its geographical position as a potential transit route for oil and natural gas exports from central Asia to the Arabian Sea," says a us department of energy report. The report also stressed that companies were unable to get a foothold in the absence of an internationally recognised government in Afghanistan. Till recently, the Argentinean oil company, Bridas Corporation, was pushing through the pipeline project because of its close ties with the Taliban regime. The us oil corporation, Unocal, had been sidelined. Unocal is linked to the Saudi Arabian oil company, Delta, which is associated with the Saudi intelligence chief, prince Turki bin Faisal. Faisal is believed to have once financed Osama bin Laden. The current war in Afghanistan, in fact, clearly is working in the interest of us oil corporations. All the key players in the current Afghan crisis -- from President Bush and Hamid Karzai (a former Unocal executive) to the top ranking advisors to the us president -- have at some point worked as lobbyists with the Taliban to secure the pipelines. The great games being played in Afghanistan have come at a great economic and human cost. 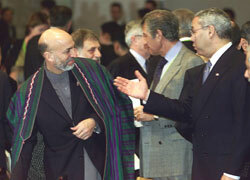 But the resilient Afghan has always fought back. Kunduz -- a town that witnessed intense battles between the Taliban and the Northern Alliance backed by usa in the current intervention -- is a historical reminder of Afghanistan's instinct for survival through its meagre resources. In the 19th century, the popular saying was "If you want to die, go to Kunduz". But Sher Mohammed Khan, the provincial governor, changed all that. He made Kunduz the cotton capital of Afghanistan from a place known as a death chamber. In just seven years (1932-1939), the province's canal irrigation network was revived and a systematic cultivation pattern was adopted. Starting from wheat to water melon to cotton, all cash crops were grown depending on water availability. This resilience shaped the United Nations Afghanistan Rural Rehabilitation Programme, which within five years in the early 1990s brought some 44,000 ha of land under cultivation by restoring the traditional systems. Now the phrase is redefined: "If you want to get rich, go to Kunduz." Social institutions vary in their structure from region to region but are coming back to life. The communal irrigation system, for example, organised by the mirab (controller of the water system), still functions effectively in many war-torn areas like the foothills of Tora Bora. When the Taliban fled Kabul, it was found that these institutions were quietly ensuring a smooth life for many villages. "In the last 10 years without any governance, people have been managing the country's micro-affairs," says Farooq Ahmed, a Pakistan-based agriculturalist . Traditionally, Afghanistan is never a nation state. People's loyalty is always to their respective pocket of tribal administration or the village heads. And the Loya Jirga, an assembly of some 1,500 community heads, is the only national entity which takes wide-ranging decisions related to common affairs (see box: Power centre). In fact, the modern notion of a centralised system is a recent phenomenon. The present Afghanistan was founded in 1747 by a combined decision of all the tribal groups just to fight the numerous invaders and to protect agriculture and other livelihood sources. Interestingly, resource distribution kept these fiercely independent groups together. By the 1930s, when modernisation of the economy began, most Afghans were engaged in the cultivation of small plots of land or tending orchards. Traditional and primitive farming methods provided the population with a subsistence standard of living. The herds of nomads rearing livestock -- some two-thirds of the population was involved in livestock production -- are still referred as the roving ambassadors of Afghanistan. 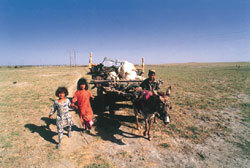 These nomadic people move between summer-grazing pastures in the highlands and winter-feeding grounds in the lowlands. As the economy is meant just for survival and the difficult terrains constrained interaction between villages, the nomads form not the only link between the villages, but also are the trading partners for these entire scattered villages in remote areas. Afghans are staunch protectors of this traditional economy and autonomy. It comes as no surprise that they oppose and fight any system that threatens their autonomy.